Miriam (or Myriam) Solovieff (1921-2004) had an extraordinary life. She was born in San Francisco and began to study the piano but after the epiphany of hearing the ten-year old wunderkind Ruggiero Ricci in 1928, she asked to be able to learn the violin. She was a pupil of Robert Pollak, then Carol Weston – who was the teaching assistant of the leading Canadian fiddler, Kathleen Parlow - and then, for four years, Parlow herself. Her first appearance with orchestra came in 1932 when she performed two movements of Lalo’s Symphonie espagnole with the San Francisco Symphony conducted by Basil Cameron. Artur Rodzinski duly invited her to Los Angeles. Further studies followed with Louis Persinger, the teacher of Ricci and Menuhin, and then a year in Belgium with Carl Flesch. She returned home to America, to the family apartment, now in New York, in November 1939. A few weeks later, between Christmas and New Year, her father, estranged from her mother, shot and killed his wife and Miriam’s twelve-year old sister Vivienne and then killed himself. He had begun the spree by shooting at Miriam but had missed. The war curtailed her career but she married and resumed playing and touring in late 1945, playing across Europe, including visits to concentration camps to play there. She moved to Paris in the 1950s, taught, performed, but had a breakdown in the early 1960s. Thereafter her performing career seems to have trailed off although she did teach. She died in Paris in 2004. The story is thus one of initial brilliance, a charmed childhood prodigy in the mould of Guila Bustabo or of Ricci, her fellow San Franciscan, followed by years of study with two of the world’s great teachers – Persinger and Flesch. Thereafter came family tragedy and the disruption of the War, followed by exposure to European horrors, and a traumatic breakdown. Solovieff made few commercial recordings. So far as I’m aware she did make one 78, with sweetmeats by Chaminade, Kreisler and Debussy, on the Cupol label. In Vienna she taped the Lalo Concerto in F with Swoboda, with whom she also recorded Schubert’s Rondo. The one LP that does crop up fairly often is Scheherazade, made once again in Vienna with Rossi conducting. 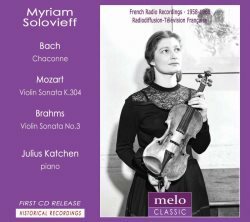 She recorded the three Brahms sonatas with Julius Katchen in the early 1960s but it was at these sessions that she suffered her breakdown. There is some conflicting information about this. Both Meloclassic’s notes and Eric Shumsky – who studied with her and admired her greatly – suggest that these recordings were never issued. They may, however, have been assigned a catalogue number as I’ve seen Decca SXL6209 mentioned in relation to these Solovieff-Katchen recordings. Ironically, whilst Katchen’s recording of the three sonatas with Josef Suk is very well known, he also recorded Nos. 2 and 3 with Solovieff’s one-time violinistic spur, Ruggiero Ricci, again for Decca. Which, at last, brings us to this 1963 Paris studio broadcast. She plays the Bach Chaconne in a measured, precise, stylish way, very different from, but at a similar tempo to, Oscar Shumsky’s later performance. It, therefore, stands at a remove from the Franco-Belgian approach propagated by Grumiaux or Enescu who took a far more tensile approach. The playing here is characterised by dignity and control, not by overmuch drama in the contrastive passages. Rubati are languid at points. It was a work she had played often – she had played it pre-war at the Wigmore Hall in London, where critics felt her technical gifts ahead of her interpretative ones. The two-movement E minor Sonata of Mozart, K304 reveals a deft ensemble with Katchen. She evinces good tone colours and a well-equalized scale and plays with musicality and style. The D minor Brahms Sonata alerts the listener as to what these two musicians did with their Brahms. I should note that their studio cycle of the three sonatas, alluded to above, whether issued commercially or not does still exist. Perhaps it is time for it to be definitively released. The playing of Op.108 is sensitive and without expressive exaggeration. It is not nearly as personalised as the Ricci recording with Katchen but is on a par with the Suk, though she lacks his range of tone colours. She essays one or two quite eager portamenti and can float her tone with sufficient body. There is no lack of rapport here. The interpretative approach is pretty consistent with the Suk-Katchen. This 50-minute recital will be particularly intriguing to violin collectors, for whom Solovieff may be no more than a name, if that. The broadcast sound is excellent.